Stát in oirthuaisceart Stáit Aontaithe Mheiriceá (S.A.M.) é New Jersey, a bhfuil meastachán daonra 9,005,644 ann de réir an Daonáirimh 2017. Tá abhainn an Hudson agus Cuan Nua-Eabhrac mar theorainn dó ar an taobh thoir, agus abhainn an Delaware mar theorainn ar an taobh thiar. New Jersey an stát is dlúithe daonra sa tír agus 462 duine sa chiliméadar cearnach. Tá 17,404.6 duine sa mhíle cearnach in Paterson, an dara cathair sna Stáit Aontaithe ó thaobh dlús daonra de. Is é "Stát an Ghairdín" leasainm New Jersey. Is é Chris Christie, ball den Pháirtí Poblachtach, an gobharnóir. Úsáidtear an giorrúchán NJ don phost. I measc na mórchathracha sa stát tá Newark, Jersey City, Elizabeth, Paterson, Camden, Atlantic City, Hoboken agus Passaic. Is é Trenton an phríomhchathair. Tá cósta fada ag an stát ar an taobh thoir ar an Aigéan Atlantach. Tugtar an "shore" air seo agus is maith le daoine áitiúla lá a chaitheamh "down the shore". Is ann atá an clár teilifíse cáiliúil The Sopranos bunaithe. Tógadh dhá cheann de na siopalanna (nó "mealanna siopadóireachta") ba thúisce i Meiriceá in Paramus, i dtuaisceart New Jersey, sna 1950idí. Tá New Jersey suite in oirthear Mheiriceá Thuaidh ar an gcósta thoir láir. Tá sé ag críochántacht le Cathair Nua-Eabhrac san oirthuaisceart, le Stát Nua-Eabhrac sa tuaisceart, agus le Pennsylvania agus le Delaware san iarthar. Tá Bá Delaware sa deisceart. Tá New Jersey roinnte ina cheithre réigiún ó thaobh na geograife fisiciúla de. Is é Máchaire an Chósta Atlantaigh an réigiún is mó. Síníonn sé siar ón aigéan go dtí an Abhainn Delaware agus ó thuaidh ó Bhá Delaware go dtí líne idir Contae Mercer san iarthar go béal na Raritan san oirthear. Tá foraoisí péine (na Pine Barrens), riascanna sáile agus feirmeacha glasraí agus torthaí ann, chomh maith le bailte saoire feadh an chósta. Níl dlús mór daonra ann sa chuid is mó den réigiún. An dara réigiún is mó (agus an chéad réigiún eile, ag dul ó thuaidh) is ea an Piedmont ([[Fraincis}}: "cos na sléibhte"). Tá an Piedmont ina chrios, timpeall 20 míle ar fad, a théann ó Alabama soir ó thuaidh go Nua-Eabhrac. De bharr an n-aibhneacha agus na n-easaanna a thug fuinneamh don tionsclaíocht san am atá thart, agus de bharr a chóngaraí agus atá sé do chathair Nua-Eabhrac, cónaíonn isteach is amach le 60% de dhaonra New Jersey sa Piedmont. Ag dul siar ó thuaidh ón Piedmont bhuailfeá le hArdtalamh Shasana Nua nó na Tailte Arda mar a thugtar orthu níos minice. Crios comhthreomhar leis an Piedmont atá ann ach é leath chomh leathan, suas le 10 míle slí ar fad. Sa chúinne den stát san iarthuaisceart tá an ceathrú réigiún, mar atá an Droim agus Gleann Mór Apaláiseach. Ní ach cuid bheag den Ghleann Mór é seo: dála na Sléibhte Apaláiseacha féin, síníonn sé trí chuid mhaith d'oirthear na Stát Aontaithe. Na Sléibhte Kittatinny a thugtar ar na sléibhte i dtuaisceart an réigiúin seo. Tá sceall agus aolchloch coitianta ann. Tá cónaí ar dhaoine i New Jersey le 10,000 bliain nó níos mó. Ag an am ar tháinig na chéad Eorpaigh go dtí an áit, bhí drong ann le fada a thug siad Lenni-Lenape (na chéad daoine) orthu féin. Bhí oirthear Mheiriceá Thuaidh ar réigiúin an domhain inar forbraíodh an talmhaíocht, cé gur éiriodh as cuid de na barra, leithéid an lus coise gé, nuair a tháinig saothrú na "dtrí dheirfiúracha" (arbhar Indiach, pónairí agus puimpcíní) aneas ó Mheicsiceo chucu. Chleacht na hIndiaigh an tsealgaireacht freisin. Bhí na Lenape roinnte ina dtrí mhórfhine ar a thugtaí Turtar, Turcaí agus Mac Tíre. Bhí Fine an Turtair lonnaithe i dtuaisceart New Jersey. Sochaí máthairlíneach a bhí acu. Is dócha gur Giovanni da Verrazanno, maraí i seirbhís na Fraince, an chéad Eorpach a thaiscéal cósta Atlantach New Jersey. Thaiscéal Henry Hudson, Sasanach i seirbhís na hÍsiltíre, an cósta níos faide ó thuaidh, timpeall Bhá Sandy Hook agus suas an abhainn Hudson. Chuaigh Cornelius Mey suas an Abhainn Delaware sa bhliain 1614 agus é ag taiscéaladh ar son na hÍsiltíre chomh maith. Trádáil fhionnaidh an bealach ba mhó a bhí teagmháil idir na Lenape agus na hOllannaigh ar dtús. Ollannach darbh ainm Pauw a chéad chuir síos i New Jersey, trasna na hAbhann Thuaidh (.i. an Hudson inniu) ó Nua-Amstardam, ar an roinn theas den oileán Manhattan. Cheannaigh sé an talamh ó na hIndiaigh. B'ait leo siúd úinéireacht talaimh ach bhí sé mar riail ag Comhlacht Dúitseach na hIndia Thoir gur ghá le lonnaitheoirí sna limistéir a bhí faoi smacht an chomhlachta a gcuid talamh a cheannach. Pavonia a baisteadh ar thailte Pauw. Bhí Pavonia agus na lonnachtaí Ollannacha eile a tháinig ina dhiaidh i New Jersey faoi riail Nua-Amstardam mar chuid den Nua-Ísiltír (Nieuw-Nederland). Sa bhliain 1638 cuireadh coilíneacht Shualannach ar bun san áit a bhfuil Wilmington, Delaware anois. De réir mar a d'fhás an choilíneacht sin (an Nua-Shualainn, nó Nye Sverige), lonnaigh cuid de na coilínigh Shualannacha agus Fhionlannacha ar an taobh eile den Abhainn Delaware, i ndeisceart New Jersey. Faoi stiúradh Peter Miniut a chruthaigh an Nua-Shualainn, Vallúnach a bhí ina stiúrthóir ar an Nua-Ísiltír roimhe sin (1626–1631). Thóg na Ollannaigh seilbh ar an gcoilíneacht Shualannach ní ba dhéanaí agus ar 24 Meitheamh 1664 thóg cabhlach faoi stiúradh an Choirnéil Richard Nicolls seilbh ar an Nua-Ísiltír in ainm rí na Breataine Móire. Thug an Rí Séamas II an talamh ar fad idir na haibhneacha Hudson agus Delaware (.i. New Jersey) do bheirt chairde a sheas leis an Teaghlach Ríoga le linn Chogadh Cathartha Shasana, mar atá, Sir George Carteret agus agus an Tiarna Berkeley of Stratton. Ainmníodh an áit Cúige New Jersey in onóir an oileán Gheirsí, a thug tearmann don Rí Séarlas II sa chogadh (agus arbh í an áit inar rugadh Carteret). Sa bhliain 1673 dhíol Berkeley a chuid féin den choilíneacht le baill de Chumainn na gCarad agus d'fhág sin New Jersey roinnte ina dhá leath, Jersey Thoir agus Jersey Thiar. Maireann cuid den teorainn idir an dá leath mar theorainneacha contae inniu. New Jersey an t-aon choilíneacht Bhriotanach i Meiriceá arbh iad daoine as coilíneachtaí eile, agus ní as an Eoraip, tromlach na lonnaitheoirí den chine gheal. Lean lonnaíochtaí na nOllannacha ag fás in oirthuaisceart an stáit faoi na Sasanaigh. Bhí páirt mhór ag Eaglais Leasaithe na hOllainne iontu. Tháinig Preisbitéirigh Albanacha go New Jersey san tréimhse sin freisin ach ba dhaoine as Nua-Eabhrac agus as Sasana Nua a chuir fúthu ansin sa chuid ba mhó, go háirithe Comhthionólaithe as Sasana Nua. Aithníodh saoirse creidimh sa dá leath den choilíneacht. 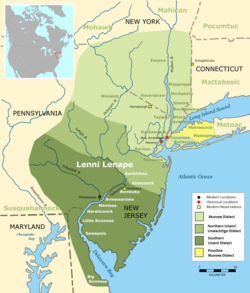 Cuireadh an chéad tearmann Indiach sna Stáit Aontaithe ar bun in Indian Mills, i lár dheisceart New Jersey, sa bhliain 1758, ach thug formhór na Lenape a aghaidh ar áiteanna níos faide siar nó fuair siad tearmann as a stuaim féin sna cnoic agus sléibhte. Ghlac siadsan le sclábhaithe agus daoine eile a bhí ag éalú an dlí. Mhair an scoilt thoir-thiar chomh fada agus mhair an dílseánacht nó úinéireacht phríobháideach (1674–1702) sa choilíneacht. Sa bhliain 1702 d'athaontaigh na Briotanaigh New Jersey mar choilíneacht ríoga seachas seachas mar choilíneacht dhílseánach. Sna blianta 1708–1738, áfach, bhí New Jersey faoi riail Nua-Eabhrac. Bhí muintir New Jersey go mór ina choinne sin agus sa bhliain 1738 cheap an Rí an Breitheamh Lewis Morris mar ghobharnóir ar an gcoilíneacht. I mí Iúil, 1776, chuir ionadaithe New Jersey a n-ainm le Forógra an Neamhspleáchais. Fearadh cuid mhaith den chogadh a bhris amach dá bharr sin i New Jersey. Bhí ceannáras an airm faoi Washington in New Jersey ar feadh dhá gheimhreadh. Bhí Cathanna Trenton, Monmouth agus Princeton ar na cathanna móra a bualadh in New Jersey sa Réabhlóid Mheiriceánach. Bhí ról sách tábhachtach ag New Jersey lasmuigh de pháirc an áir freisin. Faoi cheannas William Paterson chuidigh an stát le comhréitiú a dhéanamh idir na stáit mhóra agus na cinn bheaga. Osclaíodh an chéad phictiúrlann faoi aer le haghaidh daoine i gcarranna ar domhan in Camden, New Jersey sa bhliain 1933. Dalta na stáit eile i dtuaisceart na tíre cuireadh acht i bhfeidhm i New Jersey sa bhliain le cosc a chur le sclábhaíocht de réir a chéile. Faoi na 1830idí bhí formhór na ndaoine gorma saor; bhí timpeall is deichniúr sclábhaithe aosta sa stát nuair a cuireadh deireadh leis an sclábhaíocht ar fud na tíre sa bhliain 1865. Forbraíodh a lán tionsclaíochta i New Jersey i luathbhlianta na tíre nua agus le linn an 19ú haois. Bhunaigh Alexander Hamilton in éineacht le scata daoine eile comhlacht darbh ainm Society for the Establishment of Useful Manufactures (SUM) sa bhliain 1791. D'fhostaigh an grúpa Pierre Charles L'Enfant le cathair a phleanáil don cheantar timpeall ar na hEasa Móra ar an Abhainn Passaic i dtuaisceart an stáit le feidhm a bhaint as fuinneamh na n-eas ansin. Paterson a baisteadh ar an gcathair in onóir William Paterson. Fuair an náisiún nua roinnt mhaith iarainn ó New Jersey, go háirithe as na mianaigh guala portaigh i ndeisceart an stáit. Spreag tógáil na gcanálacha agus na n-iarnród sa 19ú haois forbairt na tionsclaíochta sa stát, go mór mhór Canáil Mhorris a osclaíodh sa bhliain 1831. D'éascaigh sin gual a thabhairt isteach o Ghleann an Lehigh in oirthear Pennsylvania. Chuir Thomas Edison faoi i New Jersey ag cur ionad forbartha teicneolaíochta ar bun, in Menlo Park ar dtús agus ansin in West Orange. Ba i Menlo Park a lasadh sráid le solais leictreacha den chéad uair ariamh, toradh a chuid oibre leis an leictreachas. Ag tús na 1900idí, d'fhás Fort Lee, in oirthuaisceart an stáit, mar an áit ba mhó déanta scannán ar domhan. Mar gheall ar an méid monarchana agus infreastruchtúr iompair a tógadh i New Jersey, bhí páirt thábhachtach ag an stát le linn an dá chogadh domhanda sa chéad leath den 20ú haois. Cuireadh na mílte saighdiúirí go dtí an Eoraip sa Chéad Chogadh Domhanda ó dhugaí in Hoboken. Tógadh cuid de na longa a d'iompair iad i New Jersey freisin, sna ceártaí longa i gCamden agus Bayonne. Ar na déantúisí míleata eile a rinneadh i New Jersey bhí armlón, gléasanna cumarsáide, agus ceimicigh. Idir an dá chogadh, roimhe sin agus ina dhiaidh, tógadh tionscail thíthíochta, áiseanna gnó, monarchana agus na háiseanna a ghabhann leo i gceantracha i New Jersey a bhí faoin tuath. D'fhág sin fás an-mhór ar na fo-bhailte ar fud an stát, cé gur tháinig meath millteanach ar na cathracha. Níl mórán cathracha móra i New Jersey i gcomparáid le stáit agus tíortha eile. Ina áit sin tá na céadta bailte, idir bheag agus mhór, iad buailte lena chéile i réimsí fada uirbeacha agus a rialtas féin ag gach aon cheann díobh. Osclaíodh an New Jersey Turnpike sa bhliain 1952, nasc idir mórcheantracha Nua-Eabhrac agus Philadelphia, agus idir an tuaisceart agus Washington, D.C.: níorbh fhada sula raibh sé ar na mórbhealaigh is mó tráchta sa tír. Osclaíodh an Garden State Parkway sa bhliain 1955 feadh an chósta. Is é New Jersey an darna stát Meiriceánach is saibhre de réir ioncam teaghlaigh—$71,180 sa bhliain. $51,358 an teacht isteach ag an meán duine aonair. $487 bn an olltáirgeacht stáit sa bhliain 2010..
De réir mheastachán Bhiúró an Daonáirimh, bhí 8,938,125 duine ina gcónaí i New Jersey sa bhliain 2014, méadú 1.66% ar na 8,791,894 duine a fuarthas le linn Dhaonáireamh 2010. Ó thaobh cine de, ba den chine geal iad 68.6% de dhaonra an stáit sa bhliain 2010. Ba 13.7% de na daoine de shliocht Afracach agus 8.3% de shliocht Áiseach. Ba de chúlra "Latino" 17.7% de mhuintir New Jersey agus dúradh Spáinnis a bheith á labhairt mar phríomhtheanga sa bhaile ag 14.59% de na daoine os cionn 5 bliana d'aois. Bhí teanga éigin seachas Béarla mar theanga dhúchais ag 28.69%, is é sin 2,345,644 duine. Tugadh an leathanach seo cothrom le dáta an 26 Meitheamh 2018 ag 21:25.